The tetsubin is a Japanese cast-iron tea pot. An indispensable buyer's guide. Early in Japanese history, tea was generally consumed in powder form during an extremely formal and elaborate ritual called the Japanese tea ceremony (chanoyu). "The tea culture of China focuses more on the quality of tea leaves, while that in Japan is centered around the procedures and philosophy of the tea ceremony. In chanoyu every tiny detail, from utensil to atmosphere, is important to create an environment that not only satisfies the taste buds, but also produces a sense of inner peace." Now, before you brew tea, you need to boil water. Given that the tetsubin is used to boil water, you would expect it to play a prominent role in chanoyu, right? Surprisingly, this is not the case. For the purpose of boiling water, most chanoyu experts prefer to use the chagama or ortegama - an iron kettle with neither a spout nor a handle! The tetsubin is more closely associated with the drinking of loose leaf tea (such as Sencha), rather than the formal tea ceremony. 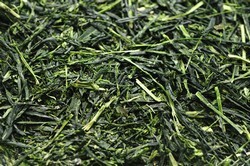 Sencha was first imported into Japan from China in the 17th century. By the mid-18th century, drinking Sencha tea had become very popular with the middle-class, who saw it as a symbolic revolt against the formality of the chanoyu, favored by the ruling class. Instead of planning for days or weeks ahead of time, they could simply grab a friend and invite them over for an impromptu cup, or make a pot of tea to share with the family. This created a need for different tea brewing equipment. Originally, the tetsubin was a plain cast-iron kettle left on the fireplace, where it was useful for boiling water and for providing heat and humidity during cold, harsh winters. When drinking Sencha tea became popular, it left its humble place in the hearth and started a new life as a tea kettle. Of course, tea ware has always been used as a status symbol. Queen Victoria did not drink tea out of a silver tea set because it tasted better. It was mostly about status. The same thing happened with the tetsubin, and the plain iron kettles began to be richly decorated with engravings and colors to illustrate the wealth and status of their owners. Tea Pot or Tea Kettle? 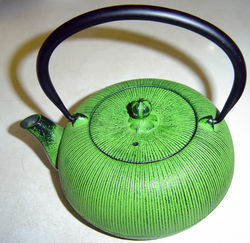 Now, many tetsubin are too decorative to be used as tea kettles. Instead, they are used as tea pots and usually come with an infuser basket for brewing tea. So, is a tetsubin a tea pot or a tea kettle? Depending on how it is made, it can be either, or both, as you will see below. What are the advantage of using these cast iron pots? First, they are attractive to admire and stylish enough to show off to your guests. They hold heat well, so a pot of tea made in a tetsubin can stay piping hot for hours. First, they can be quite heavy, especially if they are made to brew tea for multiple people. Second, the water inside stays so hot that you definitely need to use a removable infuser basket for the more delicate types of tea. Otherwise, you run the risk of oversteeping and could end up with a bitter pot. Without a removable infuser, these are really only suitable for black teas or tea bags. If you are a green tea drinker and brewing a small amount of tea for yourself, I will recommend an infuser. There are a few things to keep in mind when you are buying a cast iron tea pot. First, check and see if it has an enamel coating on the inside. An enamel coating serves two purposes: it prevents rust from damaging the tea pot and it prevents the tea from tasting metallic. Some people prefer uncoated cast iron pots because they believe they enrich the tea with extra dietary iron. I think otherwise. Most people already get enough iron, plus your tap water may already be enriched with high levels of minerals. Exposing the water to more iron may adversely affect the taste of your tea. Next, check the weight. Make sure the tea pot is easy for you to lift, and consider how much heavier it will be once you add water! Then, decide whether you want a tetsubin as a tea pot, a tea kettle or both. For example, this Old Dutch 38-Ounce Cast-Iron Nobility Teapot is made to be a tea pot only. It is quite decorative, but would not withstand direct heat from the stove. It comes with an infuser basket to brew loose leaf tea, and the inside is enameled to prevent rust. It holds just about 4 cups, so it is perfect for making tea for a small group of friends or family. On the other hand, this Japanese Cast Iron Pot tea set can be used both to heat water on the stove and to brew tea. It is sturdy enough not to be damaged by direct heat, and also has an infuser basket for brewing. This pot is much smaller than the one from Old Dutch, but it would be a good buy if you usually drink tea alone. The tetsubin is meant for boiling water. Using the boiled water from tetsubin and brew tea, it obviously changes the taste of tea. It is important to know the type of tea which the cast iron kettle is good for. There are a few groups of tea that cast iron kettle cannot get along. Tetsubin is suitable for green tea, ripe puerh, yellow tea, white tea and flower tea, yet it is not suitable for oolong, young raw pu-erh and black tea. When it is used for the right category of tea, it makes the taste mellower and sweeter. If it is used for the wrong category of tea such as oolong, the flavor becomes flat. Finally, look for a design that you like at a price you can afford! Department of Anthropology at the California Academy of Sciences . All About Tetsubins. http://research.calacademy.org/research/anthropology/tetsubin/hist.html.